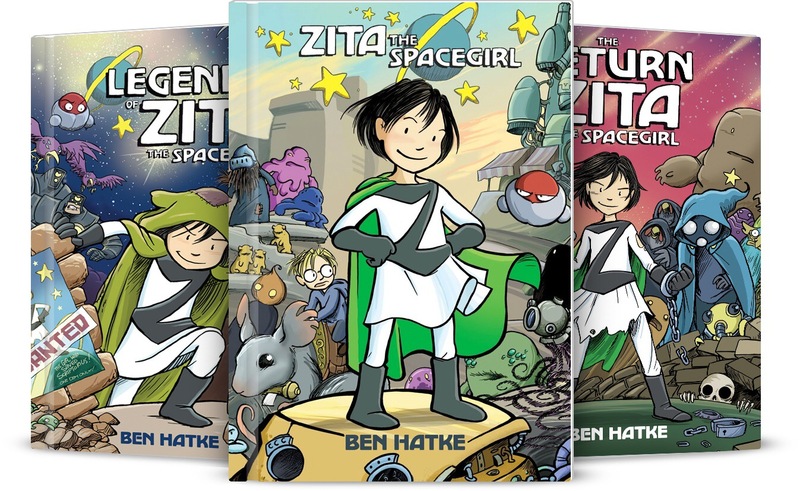 We’ve recently reviewed the third book in the phenomenal youth series Zita the Spacegirl by Ben Hatke. Our reviewer is a fan of the series, and she can prove it. Left to Right: Legends of Zita the Spacegirl, Zita the Spacegirl and The Return of Zita the Spacegirl. LisaKaren primarily reviews youth books for us. She has worked with children and books for the past 15 years in an elementary school library. Yes, that is a Zita the Spacegirl costume she is wearing. Shelving books is easier when you are a spunky superhero! Sometimes elementary schools will have themed “spirit” days , be they pajama day or hat day. Staff are encouraged to play along. On Superhero day, what better choice than Zita? As part of her lesson plan, LisaKaren reads out loud to each class (though not graphic novels). Reading to your children is important for reading success, even after they start reading on their own. So it isn’t cosplay, but the kids sure loved it!